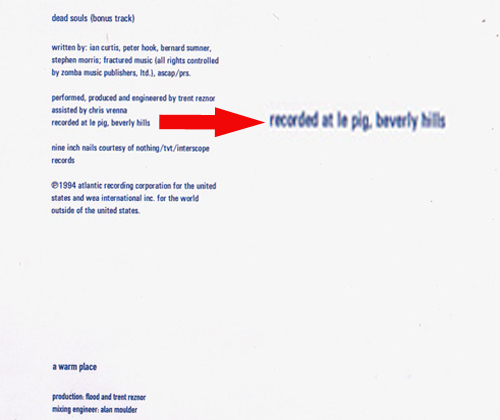 According to the album credits Nine Inch Nails recorded “The Downward Spiral” at Le Pig, Beverly Hills. “Le Pig” being 10050 Cielo Drive in Benedict Canyon, Los Angeles, California, the home of one of the most famous murders in history. 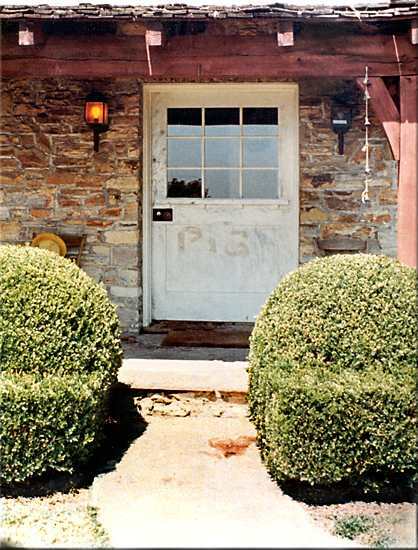 This was the site of the gruesome Tate/LaBianca murders at the hands of “The Manson Family” on August 8, 1969. 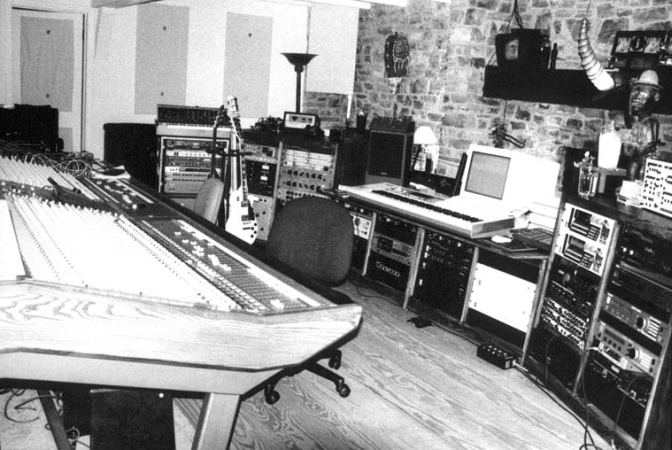 Trent Reznor and NIN set up their recording studio inside the same living room of home where most of the murders took place. Here’s a photo of “Le Pig” Studios. 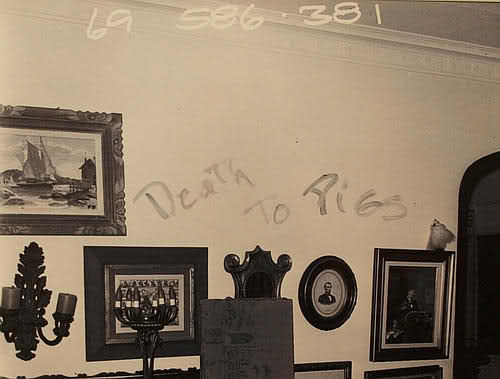 It was dubbed “Le Pig” by NIN because after the Tate/LaBianca murders the Manson Family members scrawled the word “PIG” on the walls and front door with the blood of their victims. 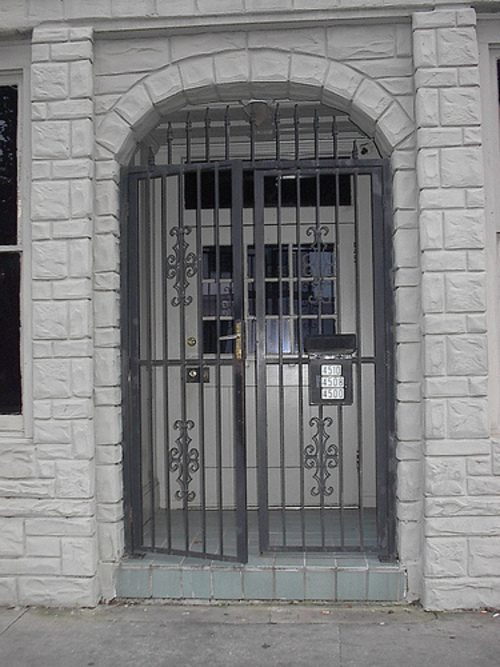 Reznor moved out in December 1993 because “there was too much history in that house for me to handle.” The house was demolished shortly thereafter making him the last known resident of the house but before the house was torn down, Reznor came back and removed the front door as a momento which he installed at his Nothing Records studio in New Orleans. Here’s the door at Reznor’s Nothing Studios a building that used to be a funeral home. When the house was demolished they changed the street address to 10066 Cielo Drive.